Looking to replace your patio doors? Learn and understand the major differences between French doors, Bi-fold doors, and Frameless Sliding Glass doors. There are not only differences regarding space and aesthetic to consider, but also installation and hardware. At the end of the day you want doors that are safe and secure, but also are functionally and spatially conducive to your home design. French doors are seen as the more traditional patio doors, often found on older properties. They typically comprise of two outward- or inward-opening doors. The reason French doors tend to best suit older properties is the wider variation in frames and glass styles available. This means they can be adapted to work with traditional features such as plate glass and old-fashioned sash windows. French doors come fitted with sheet glass panels for a more modern look, or you can opt for the small pane Victorian effect. Although French doors require more clearance to accommodate swing diameter (not recommended for small spaces), they can sometimes provide the most space because they have the ability open the entire width of the door frame. They tend to require a good amount of framework to handle structural usage and protect the glass. 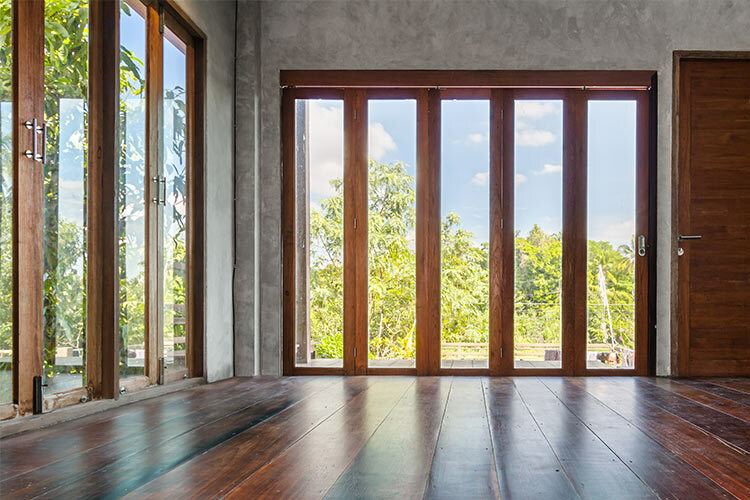 On the other hand, while many styles include weather stripping at the floor levels, most tend to have poor energy efficiency and weatherproof ratings as they can be susceptible to air and water leakages where the doors meet in the center. They also have a tendency to bow and warp in shape against powerful winds, causing additional leakage. 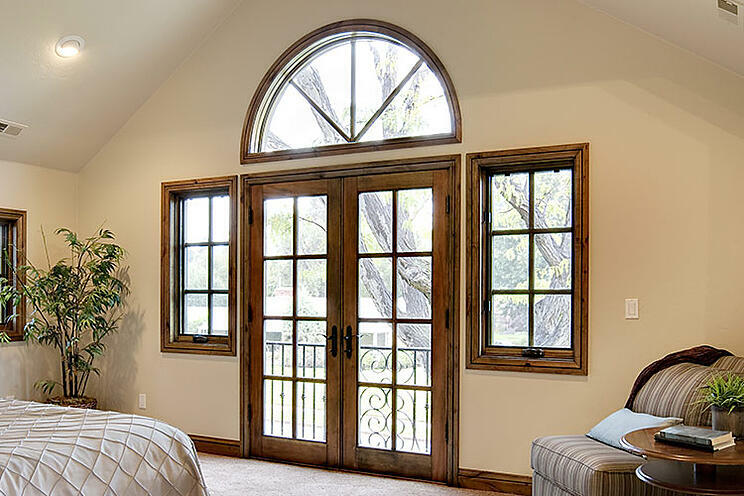 In most cases, to counteract against sagging and leakage French door models will often include a load-bearing vertical beam in the center of the opening for added security but also reducing the amount of free space within the opening. Bi-fold doors offer multiple leaves or paneling options. They are useful for smaller openings as the panels can be made rather narrow. When fully opened, they concertina and stack neatly into one another, revealing your view. The result is a seamless merger of indoor and outdoor space with absolutely no obstructions. The bi-fold design is somewhat flexible in that allows all panels to open in one direction, or open from the middle, depending on your configuration. There are also a greater choice of configurations possible - a separate traffic door or a circular wall. The disadvantages to Bi-fold doors include the obvious aesthetic and space issues. Bi-fold door systems are framework intensive, meaning less glass and more view obstructions - each panel requires all-around framework. The accordion-folded panels are often quite thick and can also greatly impede on the width of your opening. Bi-fold doors also require regular maintenance as casters and tracking channels (opening and closing points) tend to become overworked. Additionally, weatherproofing can also be a questionable factor especially in low threshold models. Frameless sliding glass equates to a beautiful means to an end – namely, opening up your home to the view on offer. Each panel is made of safety grade glass that is 5x stronger than regular annealed glass and stronger than standard tempered glass. The glass panels are custom-made to fit your home’s unique needs and are Title 24 compliant for energy-saving purposes. Frameless sliding glass systems also create a seamless transition between outdoor and indoor living space. No frames means more glass and more of the view. The top and bottom hung track channel system help the doors glide easier and are more secure (can’t be lifted of their tracks). These unique systems can accommodate a wide range of angles and openings and can be made increasingly more structurally secure with locking, deadbolt features, and alarm systems. Frameless sliding glass door systems often use a 2-factor system to ensure weatherproofing and proper track drainage. The only potential downside to owning an elegant system is that it tends to lend itself to more contemporary design uses, though there are plenty of opportunities for incorporating them into more traditional structures.